In 1988 New Jersey became the first state to enact legislation to take over schools that were underperforming or fiscally mismanaged. Through the years, other states have passed similar laws to gain control of school systems that fail to meet state standards. 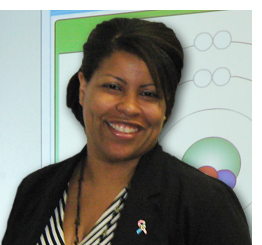 Griselda Almonte teaches in the Paterson, New Jersey, school system. Paterson has the distinction of being the second school system to be seized by the state, and is still under state control. From a thriving industrial city that was once a leisure and shopping destination, Paterson is now an urban area of high unemployment with small family-owned businesses making up the bulk of the economy. • Paterson Public Schools is one of the poorest school districts in New Jersey. 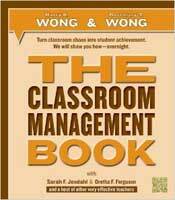 • There are no resources for teachers to use in their classrooms. Lebanese, Chechen, Arabs, Turks, Native Americans, and others. • Griselda has to lock her classroom door at lunch. We said Griselda has to lock her classroom door at lunchtime. And you can only guess why, right? Wrong! Griselda has built such an excellent rapport with her students they want to sneak out of the lunchroom and come to her classroom to sit and talk with her. Griselda teaches three double periods in a row before taking her first break at lunch. This human dynamo works relentlessly, convincing her students that high expectations and goals are completely within reach. In 2008, Griselda opted to move from teaching in a select charter school to teaching at School Number 15 in Paterson, New Jersey. She has had to adapt to working with no resources and handling up to nine special needs students in one class. the demographics of the student body. Instead, it is the teacher—what the teacher knows and does—that makes the difference in the achievement levels of the students in the classroom. Griselda started teaching at School Number 15 in May 2008. The previous teacher left in January due to a serious illness. As expected, the teacher left behind no lesson plans for the next teacher. A near-daily rotation of substitute teachers followed until Griselda was hired in May. Months passed with no lesson continuity, no classroom structure, or procedures and routines for the students to follow. There was no consistency. Griselda’s biggest concern was the lack of structure and consistency in the classroom. Her solution to that was to start her first class with a PowerPoint presentation. Griselda began by assuring her students that she was here to stay. She was not going to leave them after a few days. She was invested in them, and she would teach them to the best of her abilities. Griselda shared that she had been a pharmaceutical chemist before becoming a teacher and spent her days working with chemicals. But, she soon realized she would rather work with young people because she loves children, and she loves teaching! Griselda told her students each one was capable of succeeding in her class and the rules ensured a safe and effective learning environment for everyone. 1. Ask before getting out of your seat. 2. Be quiet when others speak. 3. Keep your hands and items to yourself. Griselda explains that rules have consequences, penalties, and rewards. She uses her PowerPoint presentation (available later in this article) to make this clear to her students. What do drivers do when they turn a corner? What do drivers do when they change lanes? How do you call a friend of your phone? How do you turn off a computer? She then comes to the most important part of her PowerPoint presentation—the part where she convinces her students classroom procedures are not for the teacher’s benefit. Instead, classroom procedures benefit everyone—and someday they will thank her for introducing procedures into their lives! Griselda shares the value of procedures with her students. Everyone will know exactly what to do. This makes school and work less stressful and confusing. It also makes it a lot easier for everyone to succeed in class! The class has more learning time. The teacher does not have to bore students by repeating the same instructions over and over again. There is no chaos in class. Class is organized, structured, and predictable. There are no unpleasant surprises. The students past few months of getting a new substitute teacher almost daily, a lack of structure in class, minimal learning, and constant chaos had convinced them that structure was not a bad word. Griselda found that her students were not only receptive to the idea of procedures—they were hungry to learn the procedures! To encourage students to convey their needs with minimal disruption to the lesson and their classmates, Griselda devised a system of hand signals for her students to use. 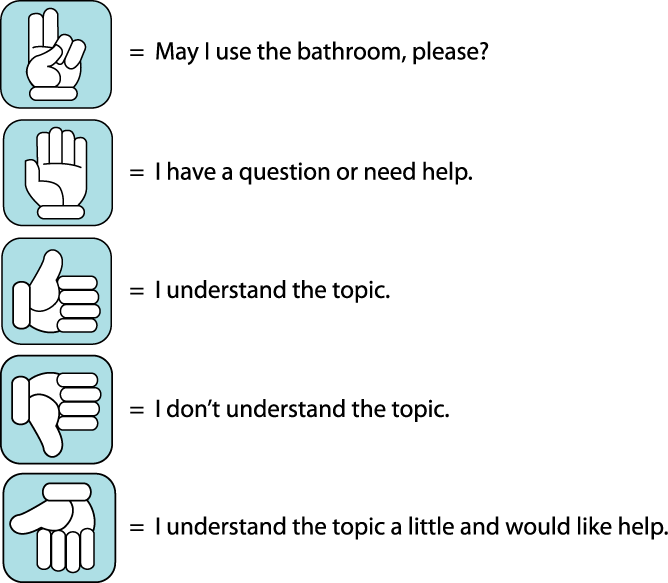 Create your own set of hand signals to communicate with your students. Noise levels will decrease and on task time will increase. Think about the requests, questions, or interactions that occur the most and then assign a hand signal to let you know the student’s need. A silent communication link is created when you respond to the request with an action, a hand gesture, a nod, or simply a smile. Click here to see Griselda’s PowerPoint presentation and more procedures her class is eager to follow. Griselda is always consistent. Everyone follows the same set of procedures and knows what to do to succeed. Griselda does not lose her temper, yell, throw objects, thump tables, flick lights, or threaten to leave. Instead, Griselda’s system of classroom procedures is easy to learn and to follow. With procedures in place, Griselda’s focus is on instruction, instead of discipline. Her students welcomed the shift in the classroom, from always being called out for their behavior and getting into trouble, to one of learning and succeeding. Her students were shocked they were being given options for their learning. The students became responsible for how they were learning. News soon spread at the school that Ms. Almonte is fair. What the students saw as being fair was really what happens when procedures are in the place in any classroom. The teacher is able to be creative in tailoring instruction to the needs of the students. Griselda asks each student to sign a Teacher-Student Contract. I will follow all the classroom procedures to the best of my ability. of my teacher and peers. I will always put my best effort to doing well in all my classes. 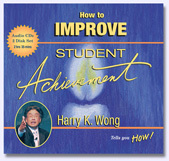 The high expectation is for students to put forth their best effort at all times. This contract also contains a commitment from Griselda to the student. I will teach you to the best of my abilities and I will be sensitive to your needs. you and give you 100% of my attention. The student, the student’s guardian, and Griselda all sign the contract asking for everyone’s best effort throughout the school year. Click here to see Griselda’s Teacher-Student Contract. We get many letters from teachers seeking advice on what to do with a classroom that is disorderly. Our answer is always the same, “We would be pleased to help, but first, we need to understand your classroom situation. 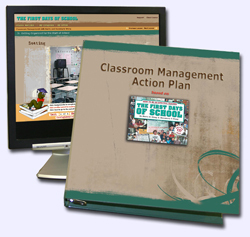 Please share your classroom management plan with us.” We never hear back from the teacher. And we know why. When it comes to handling behavior problems in the classroom, there are two kinds of teachers—reactive and proactive. The REACTIVE teacher has no organized classroom structure and reacts to every behavior problem with yelling, screaming, punishment, threats, and coercion to whip the classroom into compliance. 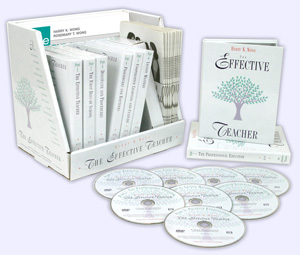 The reactive teacher goes home angry, tired, and stressed out. The PROACTIVE teacher knows that the greatest problem in the classroom is not discipline. Instead, it is the lack of procedures and routines—the lack of a plan that organizes a classroom for academic success. 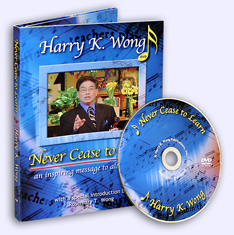 The proactive teacher knows how to prevent problems and thus have a successful classroom. This teacher can go home at the end of the day, satisfied with the knowledge that his or her students have learned. in their classrooms no matter the teaching environment. expect of their students no matter their personal background. We know that an effective teacher can turn things around—no matter how challenging a situation. Past columns have featured teachers in similar conditions. Read last month’s column about Marco Campos, another successful inner city school teacher. 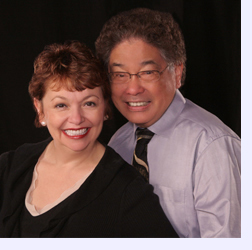 Elmo Sanchez (August 2007) and Alex Kajitani (December 2007) are inner city teachers who have chosen to be proactive. Read about Bernie Alidor (May 2008), an amazing kindergarten teacher and Liz Breaux (February 2002), a stress-free teacher in a high poverty school in Louisiana. These teachers all work relentlessly at making things better by constantly learning, trying, tweaking, adapting, applying, observing, monitoring, encouraging, nurturing, and building. At the heart of their efforts is the belief that all children are capable of success and it is their job as teachers to produce that result. Griselda’s few weeks of success at the end of the last school year was no fluke. She continues to be the positive influence in her students’ lives and they are responding in return. One student had so many F’s on his report card he should not have been promoted. However, our school does social promotions and moved him on. In 7th grade, this student was receiving A’s and B’s in my class! I do not curve my tests. Now, in 8th grade, he has the highest score of a 98A+ in class. I had a student I could not get through to last year. The student was satisfied with earning D’s due to a disability, but I encouraged him to aim higher. Well, this year is the breakthrough—he has an 85B in my class! I did not make any modifications to his tests, and I can see he is working really hard. I was thrilled to call his mother and grandmother to tell them the news. I can keep telling you about the amazing achievements my students have made, but the list would be so long! I honestly believe that when you can get your students to trust you, they will work very hard to exceed your high expectations of them. 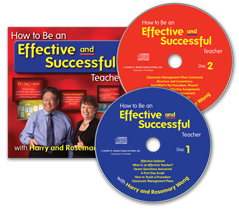 The basic elements of success are the same for all classrooms. All effective teachers know the formula and apply it in their classrooms daily. 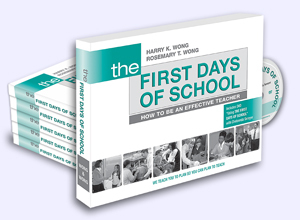 Use the equation each day to produce a predictable classroom environment. Personalize the equation and add the components needed for your situation. The result will yield a unique bond of learning and success for you and your students.